Meet the Ehly family! Ted and Melinda signed up for one of my mini sessions in the fall and I couldn’t wait to photograph them! They are adorable and I wish I had their sense of style and adventure. Their family’s favorite place to be is outside (and with 3 boys, I can imagine they get pretty rowdy if they have to stay inside!) and they love camping and kayaking. I love the holidays - the lights, the decorations, the family time, and yes, the food. I also love our family traditions - reading stories, Grandma making the kids sing before opening presents, baking cookies, making gingerbread houses - and I need to get better about documenting those as the kids get older! 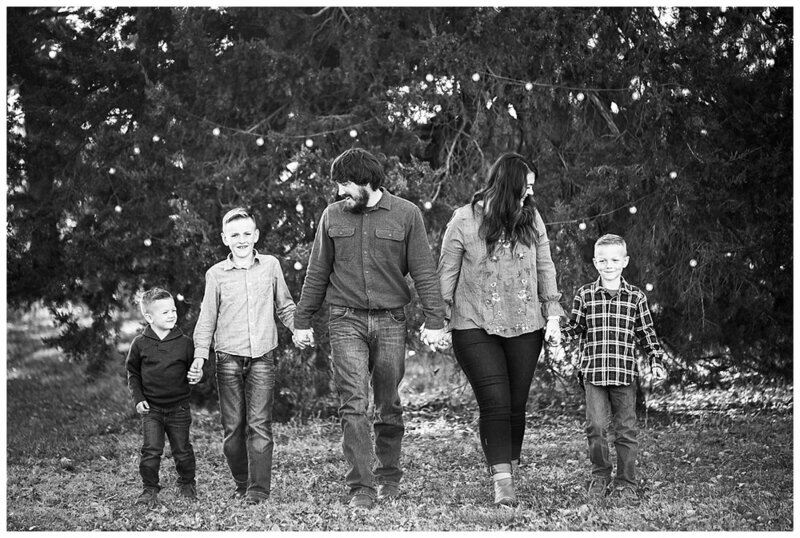 This year, I decided to offer Holiday Traditions mini-sessions. I will come to your house and spend 30 minutes taking photos of a holiday tradition that you want to remember...things like decorating the Christmas tree, wrapping presents, playing a game of football after your turkey dinner, playing in the snow and then warming up with hot chocolate, making Christmas crafts, decorating cookies, visiting a Living Nativity, playing board games with Grandma...the possibilities are endless! After the session, you will get 10 digital images and 25 Christmas cards! You will be able to pick the design and photos for your Christmas card and they will be sent to you within 3 days. Super easy. Extra cards can be ordered...the cost is $30 for 25 cards. Contact me if you would like to reserve a date!